I was contacted by a company, The Pencil Grip, to do a review of their paint markers which are called Kwik Stix, which my boys love! 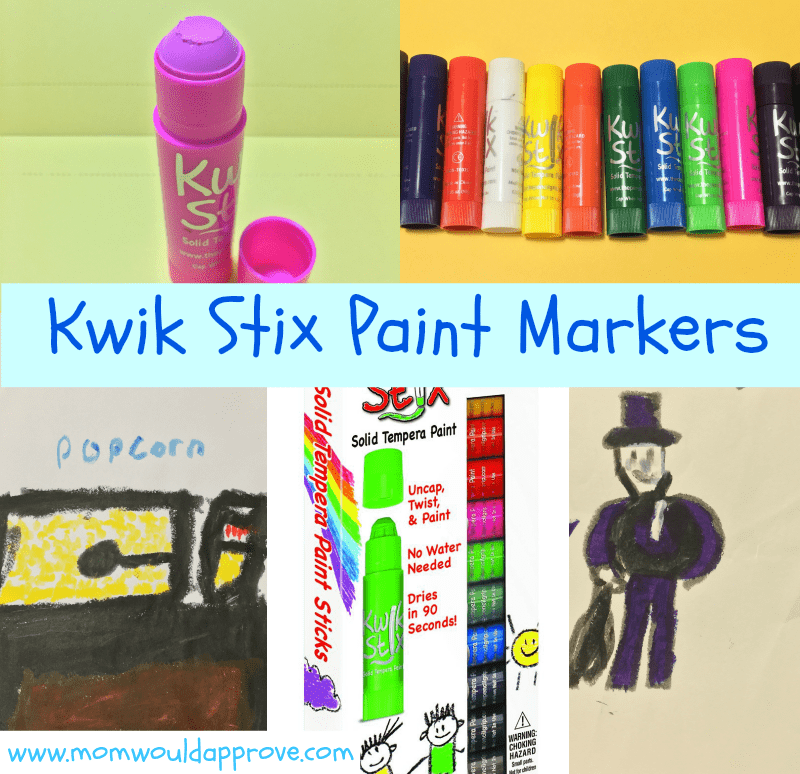 We received a box of their 12 count Kwik Stix paint markers, all different colors. They are Non-Toxic, you can paint on regular paper, poster, and even construction paper and it dries in 90 seconds. They are solid tempera paint which means that it dries quickly and can be cleaned up with water. I asked both boys to draw a picture with them and they were done so quick! I like how fast they dry, I don’t have to worry about them having paint hands like other paints and markers leave behind. You know what I’m talking about, where the hand that they were drawing with has paint up and down their palm. 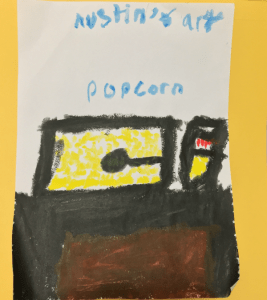 Austin choose to draw a popcorn machine, I think because we had just gotten back from seeing a movie. That literally took about 5 minutes, you know after he set everything up and then figured out what he wanted to draw. 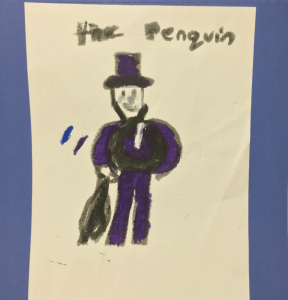 Cameron choose to draw The Penguin, I’m thinking because they are addicted to their batman video games. His didn’t take long to draw or color either. I would describe them as being a glue stick with the paint looking like a crayon but with a paint consistency. If it does happen to get on their hands, you just rub them together and it comes right off. I like how small they are and love that I don’t have to worry about them spilling and making a mess all over the carpet. We’ve never used paint markers before but after these, I think we can get rid of our regular messy ones. You’re welcome Sue, good luck! My Eva.9, draws constantly and wants to be an artist and live in a small apartment and sell her painting to museums and galleries. I don’t think she has a favorite color, but she seems to like blues=purples-periwinkles for her room. These paints look really cool and easy to use. Wow sounds like someone has their life figured out already 🙂 Good luck! 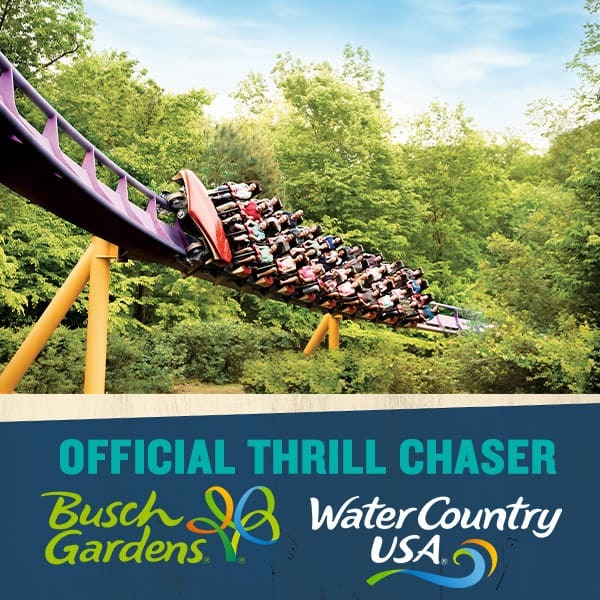 These look like soooo much fun. They would be perfect for my messy little man. My little boy doesn’t have a favorite color. He seems to like them all and the brighter the better. I remember when mine were that age, had to color everything. Good luck Samantha! My niece’s favorite color is green. 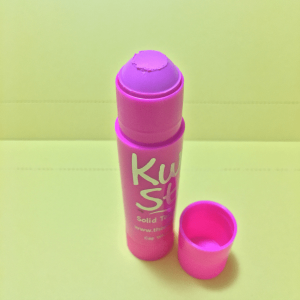 Thank you for commenting, Good luck! Blue or any shade of purple would be my daughters favorite color. Blue and purple are my favorite colors too. Good luck Maryann! Blue is one of many. That’s one of my favorites as well! Their favorite colors are turquoise, green and blue. My 3 kids like red, blue, and blue.